Eleven years ago, NPR ran a four-part series of reports called Water in the West. This summer, Lake Mead is at record lows not seen since the reservoir was first filled. Water in the West holds up well today. And it has me thinking about how water use has shaped the ecology of Grand Canyon. 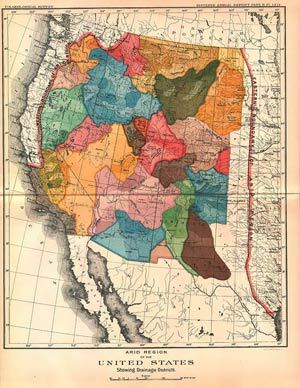 John Wesley Powell proposed organizing the west according to drainage districts. The citizens of each district were to be responsible for deciding how to administer the use of water as a communal resource. It never happened. That the river is managed to preserve a state of (near) wilderness is something of a minor miracle. In the decades following John Wesley Powell’s scientific exploration of Grand Canyon, later expeditions surveyed the land in anticipation of railroad construction and dam building. Powell’s vision for the development of the West called for prudent use of limited water resources. For many at the time, his vision was too prudent, and it conflicted with the era’s prevailing belief that “rain follows the plow.” This philosophy held that the very act of farming the West’s semi-arid regions would result in additional precipitation, thereby making the land agriculturally productive. From a modern perspective, this belief seems ridiculous. But it held sway at the time, and 19th-century policymakers unable to recognize the West’s climatic realities are today responsible, in part, for how we use water in the 21st century. However, even if Powell’s vision had won out, I believe that Hoover Dam and Glen Canyon Dam (downstream and upstream of Grand Canyon, respectively) would still be realities today. With the Colorado River harnessed behind Glen Canyon Dam in Lake Powell, dramatic seasonal fluctuations and occasional major floods through Grand Canyon have all but disappeared. Lake Powell traps 100 million tons of sediment every year. Since the dam’s construction, the color of the Colorado River has changed from a muddy red to a striking blue-green color. Although the river runs unhindered through Grand Canyon, it does not run unchanged. At any rate, the Water in the West series is well worth a listen. You can download the radio reports as MP3 files below.